If you’ve followed me for a while, you may have noticed that I love adding natural elements into my home decor. 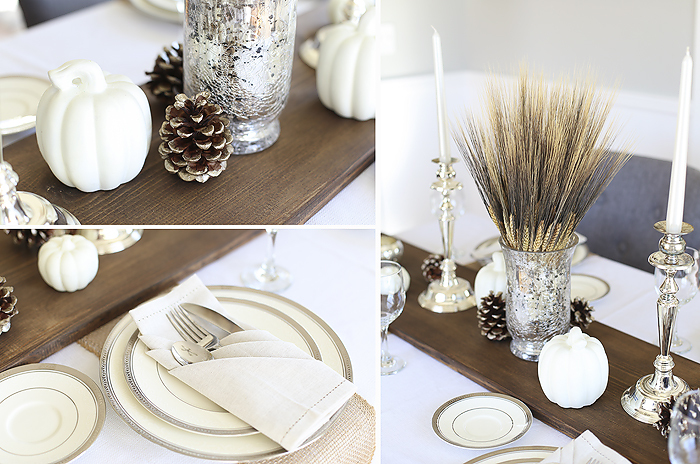 This fall tablescape is no exception. 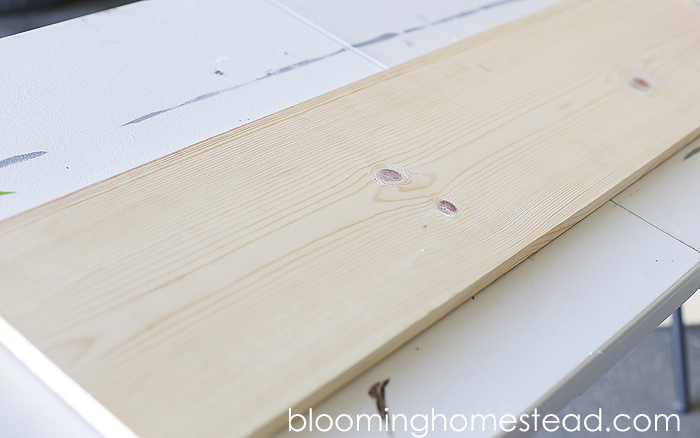 I made this DIY Rustic Wood Table Runner and not only was it easy, but it cost me under $8.00. A beautiful statement piece for any setting. First off you’ll want to measure your table length. Mine is 57″ long so I chose a 1×12 8 foot board that I had cut down to 56″. 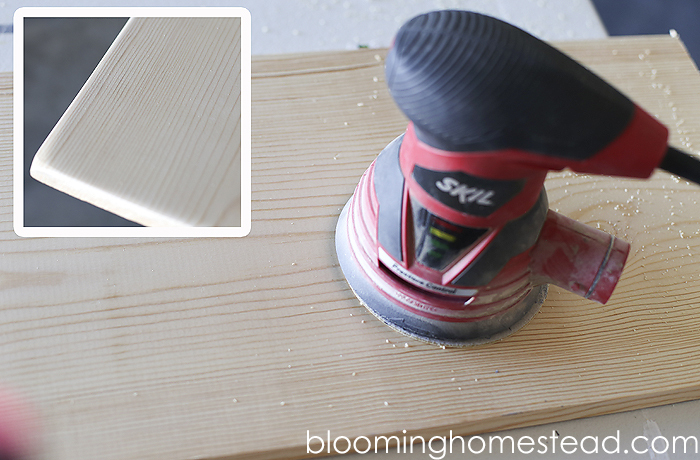 Now you’ll prep your wood by sanding. I used course sandpaper to get it nice and even and then went over it with a fine grit sandpaper to finish off. I chose to round my corners and edges but that is optional. Wipe down any dust from your board and you’ll be ready to stain your wood. Once your stain has cured you can add a coat of polyurethane to finish off your board. And now you have a beautiful, rustic wood runner that makes the perfect addition to any setting. 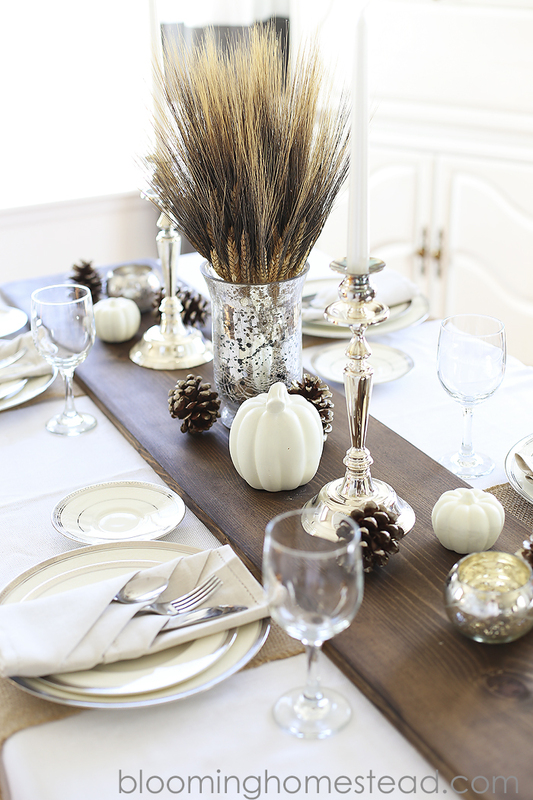 These white pumpkins and mercury glass votives add such a fun contrast to the rustic wood. I also love this diy wheat centerpiece (you can find the details for that here). Looking for more fabulous tablescapes or place settings? I’ve joined with 24 other bloggers to share some great ideas you have to check out! I link up to these parties here. Oh! The table runner is so simple and pretty! I love the wood and mercury glass combo! This table is so beautiful, Marie!! 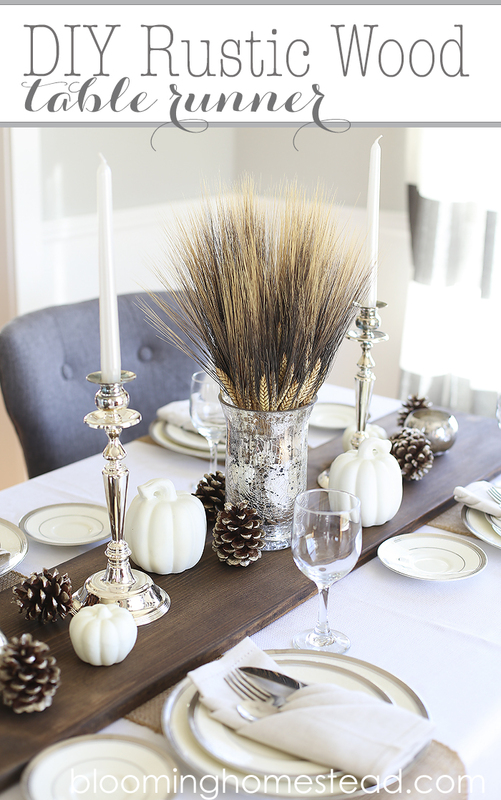 I love the wood table runner paired with the white and silver accents. The perfect combination! Thanks for the inspiration! So elegant with all whites!! Just lovely, pinned. Funny, we used reclaimed wood as our runner! Your table scape looks amazing!! Absolutely stunning, friend!! 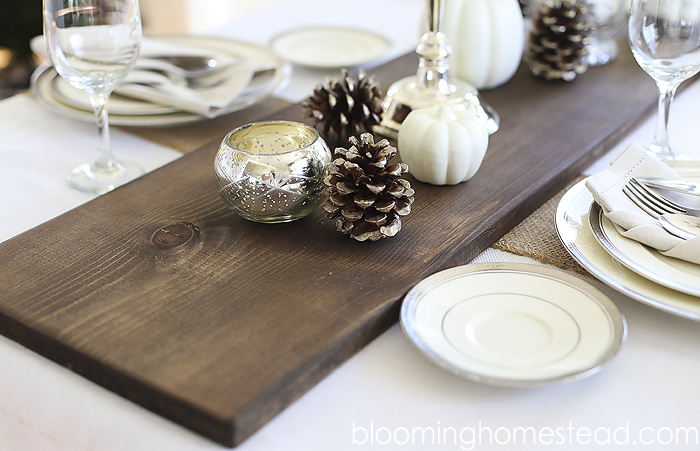 Stained wood as a runner is a perfect addition to a tablescape. HUGS!!! Absolutely stunning! The rustic dark would looks fabulous with the other light, neutral colors! I love your table runner and the whole neutral theme! Beautiful! gorgeous- the entire table is just beautiful!!! This is so gorgeous! Love the white against the dark wood! 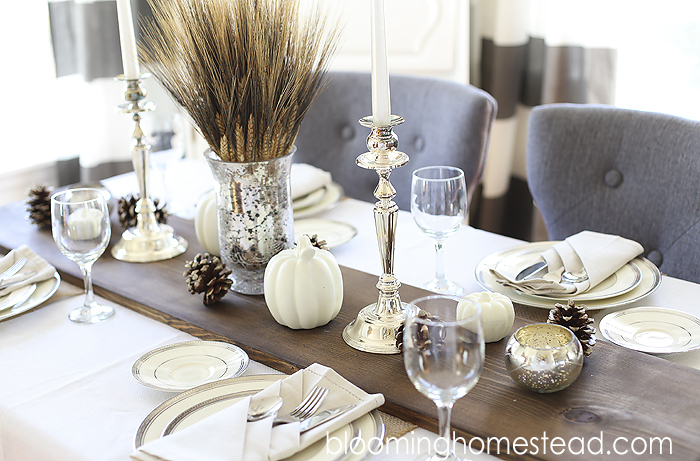 Love how you paired the rustic wood runner with such an elegant table. Beautiful! what a gorgeous table! I love this idea – thanks for sharing!! Gorgeous, gorgeous table! Thanks for sharing! PINNED! I’ll share a tutorial soon, it is so easy but I love the look! This is truly beautiful! I love the simplicity and all the natural elements. Bravo! I’m starting a link party this weekend and this project would fit in beautifully- it’s called “Found & Foraged” and we hope to be able to feature collected design and DIY’s using the beauty that is already around us. It’ll be at 8 pm on Saturday and I’d be so thrilled if you stopped by. You can find me at http://www.averystreetdesign.com. Hope to see you! Thanks Laura, I will be by to link up! What a great idea! 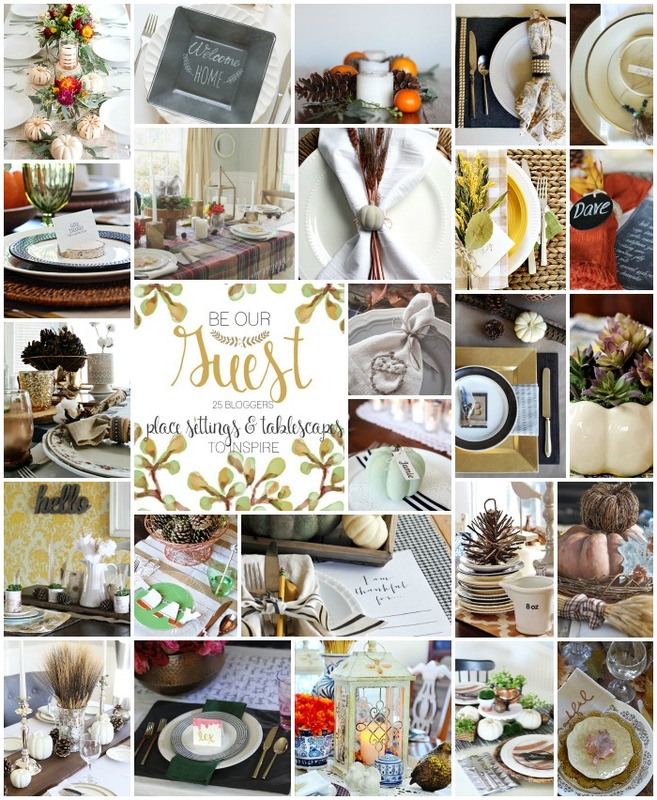 I love your Thanksgiving tablescape! The wheat is so pretty in the mercury glass vase. I like the change of the white and silver and brown instead of all the orange you see at this time of year! Love this. Is it cheating if I have the guy at Home Depot cut the wood for me? Thats just smart Heather! Saves some work. I LOVE the decorations you put on the table. If you don’t mind telling… where did you find them? That is gorgeous!! I love the beautiful wood grain! Thanks so much, I love the look of the wood. This is gorgeous! Perfect idea! This is absolutely gorgeous! So simple yet perfect. Love your blog, by the way, Marie. I’m always stumbling upon it and find myself getting lost in all of your beautiful projects here. Love this idea and how it not only ads rustic charm to a table setting, it’s also a built-in hot plate for warm serving dishes. I’m making this! Exactly Vicki, I really have been loving it! I love this so much! This is exact;y what I have been looking for! You may even see my own version this year if I have time to blog about it! That sounds great Kassandra, I’d love to see it. beautiful tablescape! I LOVE it! !